The global photodiode sensors market is witnessing significant advancements due to increased dependence of medical instruments on photodiode sensors for use in pulse oximetry, spectroscopic analysis, and medical imaging. Among end-use industries, aerospace & defense and consumer electronics are anticipated to be highly lucrative segments during the forecast period. Photodiode sensors have certain unique features such as integrated functionality, improved performance, high reliability, and high speed of response. 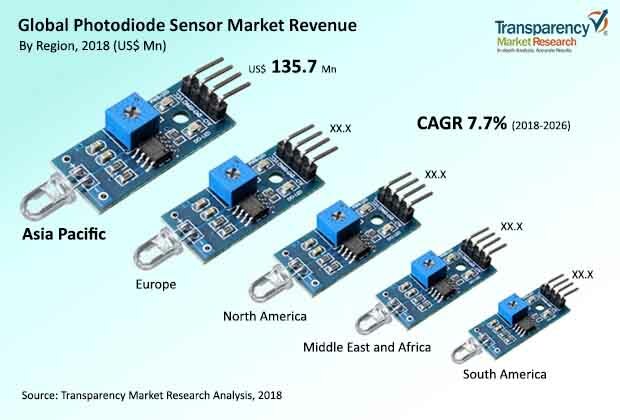 The global market for photodiode sensors is projected to reach value of US$ 867.7 Mn by 2026 from US$ 444.8 Mn in 2017, registering a CAGR of 7.7% during the forecast period. The rapidly rising demand for portable barcode scanners in the retail industry is expected to fuel the demand for highly efficient photodiode sensors in the near future. Barcode scanning systems help businesses track a high volume of information. This, in turn, increases productivity and efficiency of these businesses. The key drivers for exploration of new optical detectors are success of the semiconductor technology and emergence of new applications (optical communication, optical sensing, etc.) that demand better properties, lower price, and miniaturization. However, certain factors such as poor temperature stability, higher operating voltage, and dark current temperature dependency of photodiode sensors are restraining the market. The photodiode sensors market has been segmented based on photodiode type, wavelength, material, end-use industry, and region. In terms of photodiode type, the market has been divided into PN photodiode, PIN photodiode, avalanche photodiode, and Schottky photodiode. The PIN photodiode segment has been sub-categorized into silicon, germanium, and others. In 2017, the avalanche photodiode segment accounted for the leading market share in terms of revenue. In terms of volume, the PIN photodiode segment held the major market share, followed by the PN photodiode segment. This is due to high-bandwidth applications and additional sensitivity features of PIN photodiodes. In terms of wavelength, the market has been classified into ultra violet (UV) spectrum, visible spectrum, near infrared (NIR) spectrum, and infrared (IR) spectrum. In 2017, the infrared spectrum segment accounted for more than 33% share of the global market. Furthermore, the segment is projected to gain market share during the forecast period, due to ongoing advancement in fiber optic communication that typically operates in infrared wavelength. In terms of material, the global photodiode sensors market has been divided into silicon (Si), germanium (Ge), gallium phosphide (GaP), indium gallium arsenide (InGaAs), and others. The silicon segment holds a major market share, as these photodiodes feature high speed of response, high sensitivity, and low noise. A significant increase in the adoption of InGaAs is projected during the forecast period, as several applications requiring the detection of light with longer wavelengths are expected to deploy InGaAs photodiode sensors in the near future. Based on end-use industry, the global photodiode sensors market has been segregated into telecommunication, health care, consumer electronics, aerospace & defense, and others (research, automotive, etc.). Consumer electronics and telecommunication segments are projected to hold significant market shares during the forecast period. The health care segment is estimated to gain market share during the forecast period, as several types of photodiode sensors are being incorporated in biomedical applications such as pulse oximetry, spectroscopic analysis, and medical imaging. Geographically, the global photodiode sensors market has been segmented into North America, Europe, Asia Pacific, Middle East & Africa, and South America. Asia Pacific leads the global photodiode sensors market both in terms of revenue and volume, followed by Europe. The photodiode sensors market in developed regions such as North America and Europe is a comparatively mature market. The overall outlook for the market in Asia Pacific appears positive. The region is expected to hold a significant share of the global market during the forecast period, owing to prominent growth of major economies in the region as a result of investments and government initiatives to promote economic growth. The markets in Middle East & Africa and South America are expected to witness sluggish growth compared to other regions during the forecast period. Key players operating in the global photodiode sensors market are First-sensor AG, Excelitas Technologies Corp, Hamamatsu Photonics Deutschland, Kyosemi Corporation, OSI Optoelectronics, Edmund Optics, Quantum Devices, Rohm Semiconductor, Thorlabs, Inc., Everlight, and ON Semiconductor. Top ten players in the market hold nearly 50% share of the global photodiode sensors market. This comprehensive report by Transparency Market Research analyzes and forecasts the “Photodiode Sensor” market at the global and regional levels. The report provides analysis for the period 2016–2026, wherein 2018–2026 is the forecast period and 2017 is the base year. An in-depth and unbiased market assessment has been made to offer readers in-depth and accurate analysis. The report emphasizes all major trends likely to play a key role in growth of the photodiode sensors market from 2018 to 2026. It also focuses on restraining factors, market drivers, and opportunities for the photodiode sensors market. The study provides a complete perspective on the photodiode sensors market in terms of value (in US$ Mn) and volume (Million Units) across various geographies including Asia Pacific, South America, North America, Middle East & Africa, and Europe. The report includes detailed value chain analysis, which is focused to offer a widespread view of the global photodiode sensors market. Porter’s five forces analysis is also provided to understand the competition scenario in the global photodiode sensors market. The study incorporates market attractiveness analysis, wherein market segments based on photodiode type, wavelength, material, and end-use industry have been benchmarked based on their market size, growth rate, and attractiveness. In order to offer a complete analysis of the overall competition scenario in the photodiode sensors market, attractiveness analysis of every geographic region mentioned in the report has been provided. The market overview chapter in this report on the photodiode sensors market explains market trends and dynamics including restraining factors, drivers, and opportunities for the current and future market for photodiode sensors. The market outlook analysis has also been provided in the report. Additionally, the report provides analysis of different business strategies adopted by leading players in the photodiode sensors market. The market introduction chapter assists in gaining idea of different trends in the photodiode sensors market in terms of photodiode type, wavelength, material, and end-use industry. The study provides a decisive view of the global photodiode sensors market, by segmenting the market in terms of photodiode type into PN photodiode, PIN photodiode, avalanche photodiode, and Schottky photodiode. Based on wavelength the market has been divided into ultra violet (UV) spectrum, visible spectrum, near infrared (NIR) spectrum, and infrared (IR) spectrum. Based on material, the market has been segregated into silicon (Si), germanium (Ge), gallium phosphide (GaP), indium gallium arsenide (InGaAs), and others. In terms of end-use industry, the market has been classified into telecommunication, health care, consumer electronics, aerospace & defense, and others (research, automotive, etc.). The report provides detailed breakdown of the global photodiode sensors market region-wise and categorizes it at various levels, thereby providing valuable insights at micro- and macro-levels. The report highlights the competition scenario in the photodiode sensors market, thereby ranking all major players according to the key recent developments and geographic presence of these players. The insights for the photodiode sensors market is a result of TMR’s extensive primary interviews, secondary research, and in-house expert panel reviews. The market estimates have been analyzed by considering the impact of different economic, political, social, legal, and technological factors. Among regions, the market in North America has been classified into Canada, U.S., and Rest of North America. Furthermore, the Europe market has been divided into France, Germany, U.K., and Rest of Europe. The APAC market has been segmented into China, Japan, India, Australia, and Rest of Asia Pacific. The market in Middle East & Africa has been segregated into GCC, South Africa, and Rest of Middle East & Africa. Similarly, the market in South America has been segmented into Brazil and Rest of South America. This report provides all strategic information required to understand the photodiode sensors market including the segmentation based on photodiode type, wavelength, material, and end-use industry. Also, the report provides insights related to photodiode type, wavelength, material, and end-use industry according to various geographical regions mentioned above. The research methodology is a perfect combination of primary research, secondary research, and expert panel reviews. Secondary sources such as annual reports, company websites, SEC filings, and investor presentations, national government documents, internal and external proprietary databases, statistical databases, relevant patent and regulatory databases, market reports, government publications, statistical databases, World Bank database, and industry white papers are usually referred to. Furthermore, for this report, TMR has specifically focused on the data from the global defense budget, military spending on power supply, and development in the next-generation power supply. Primary research involves telephonic interviews, e-mail interactions, and face-to-face interviews for detailed and unbiased reviews on the photodiode sensors market across geographies. Primary interviews are usually conducted on an ongoing basis with market experts and participants in order to obtain the latest market insights and validate the existing data and analysis. Primary interviews offer new and fresh information on important factors such as market trends, market size, competition landscape, etc. These factors help validate and strengthen secondary research findings. Moreover, the data collected and analyzed from secondary and primary research is again discussed and examined by the expert panel of TMR. The research study includes profiles of leading companies operating in the global photodiode sensors market. Market players have been profiled in terms of attributes such as company overview, financial overview, business strategies, and recent developments. Parameters such as investment in and spending on photodiode sensors and development by major players in the market have been tracked. Some of the key players operating in the global photodiode sensors market are First-sensor AG, Excelitas Technologies Corp, Hamamatsu Photonics Deutschland, Kyosemi Corporation, OSI optoelectronics, Edmund Optics, Quantum Devices, Rohm Semiconductor, Thorlabs, Inc., Everlight, and ON Semiconductor.